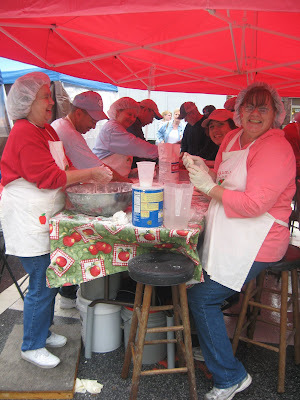 Happy Fried Apple Pie Baking Crew at the Barbecue Festival, Lexington, NC. Fried apple pies always make me smile. If I see or smell fried pies, I think of my Grandma. She was from the mountains of Virginia. There was an apple tree out behind the farmhouse. She'd cut up apples for the year when they were in season and make her fried apple pies for special occasions. Grandma is gone now, so it's a treat to get fried apple pies at the Lexington BBQ Festival. That's a yearly festival featuring - of course - barbecue but also lots of other great goodies like the fried pies. Fried pies are kind of like the ones served at Hardees and at BoJangles, but the homemade are so much better. Not throwing off on the fast food chains. But, it's hard to beat home cooking. I chatted today with the fried pie people. I would say fried pie ladies, but they did have a man back there and also a younger guy who looked to be in his teens or 20s. Thumbs up on that. The group comes down every year to make the pies. It takes a couple of hours. One of the women told me she got up at 2 a.m. this morning to get everything ready, on the road, and cooking at the festival. These fried apple pies are the real deal. You can see the can of Crisco and the flour. The pie makers are lined up and making pies as fast as they can. Other members of the group are out front frying. You can watch the whole thing from start to finish. The only real difference in the Barbecue Festival fried apple pies and my Grandma's is that they deep fry. Grandma used an electric skillet and flipped hers. That takes longer but uses less Crisco or oil. The crust part is a little crisper on deep fried versus pan fried apple pies. If you ever get out to the Lexington, NC Barbecue Festival, be sure to get a fresh fried apple pie. You may have to wait a while in line depending on the time of day, but it's definately worth the wait. If you don't live in the area, then look for my fried apple pie recipe coming soon on Yes You Can Cook. That's my newest web site. I'm plugging away, but it takes a while to get everything up. I'm slowly adding the family recipes, and I really need to get the fried apple pie directions up there. If there were just more hours in a day . . .
Hello Cyndi! Fellowed you over from my blog 'On The Bricks'. Thank you so much for stopping by there and commenting on the BBQ Festival. Glad you had fun there. BTW: Very nice blog you have and would be a pleasure to visit here more! You'll have to get on back down this way. Hit me with an email if you do. I like to meet other bloggers and barbecue folks.